In Marin County, California, where people tend to have money, people in Belvedere tend to have more. Even so, a recent decision by Clark and Sharon Winslow of 337 Belvedere Avenue to buy the home next to theirs for $4.2 million — and then tear it down — might seem extraordinary. It's not, say locals and real estate professionals. "There are houses being torn down all the time," says Bill Smith, realtor and ex-mayor of Belvedere. 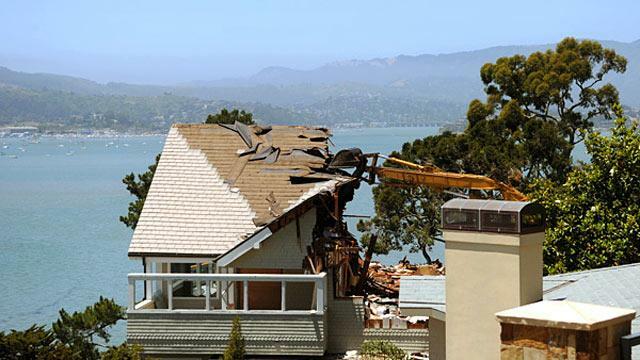 In neighboring Tiburon, he says, a buyer not long ago paid $20 million for the home of tennis star Andre Agassi and wife Steffi Graf, then announced his plan to raze it. "People tear down homes for all kinds of reasons," says Smith, including the two ascribed by Marin's Independent Journal to the Winslows: They want to improve their view, and they want to plant some bushes. What Will Rogers once said about real estate's being a good investment ("They're not making any more of it") may hold truer here than anywhere else in the U.S. In Belvedere there truly are golden lots. The best, perched atop high cliffs, look out upon San Francisco and its Bay, upon the Golden Gate, and through it, the Pacific. Natives say half-jokingly that on a clear day you can see Japan. Asked if it is possible, here, for a view to be worth $1 million, Smith scoffs. $1 million? That's nothing. "There are multi-million views." A call by ABC News to the Winslows asking for their comment went unreturned. Scott Dingwell, a 20-year resident of Marin, lives in Kentfield, to the north. His lovely 1950s home has extensive gardens, a swimming pool and a commanding view of Tamalpias, the local mountain. Were he to put it on the market, he thinks, its' value would be around $1.3 million. It's almost certainly a tear-down, Dingwell says. "If Larry Ellison or Bill Gates wants to buy my house and tear it down," he says, "more power to him -- he'd have a better view. I'm fully supportive of this trend."